There are reportedly four migrant caravans heading toward the U.S. border with Mexico — and it might not stop there. Reports of caravans prompt thousands to travel north from Central America, through Mexico to the U.S., according to a New York Times report published Wednesday. The NYT speculates that the caravan phenomenon is due to the fact that migrants see a large group as almost immune from the exploitation of organized crime and human smuggling. The organization Pueblo Sin Fronteras (translated as People Without Borders) would agree. It has been assisting migrant caravans for 15 years and believes there is strength in numbers. Migrant caravans usually begin their journey around Easter and the phenomenon isn’t entirely new. 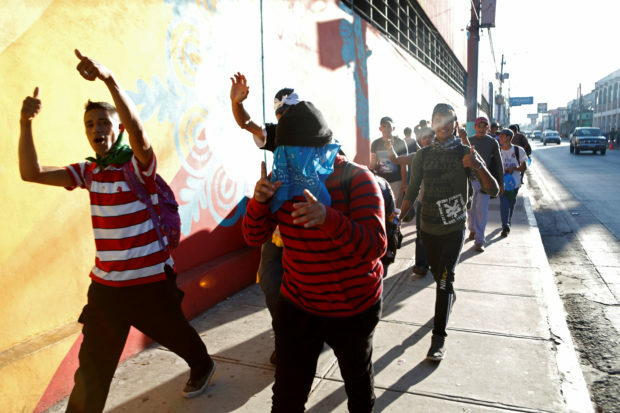 According to some of people interviewed by The NYT, most of the migrants are aware of the American government’s antipathy towards their illegal immigration tactics but believe President Donald Trump will feel differently when the masses arrive at the border. Regardless of the migrants’ expectations, they face hostility in the U.S. from some. U.S. Customs and Border Protection confirmed Wednesday to The Daily Caller that border patrol officers had warned Texas residents about militia forces possibly entering the area to resist the migrant caravans. There have been some ominous revelations and allegations as the caravans have found their way northward. According to one Reuters report, some of the migrants are armed with guns and Molotov cocktails in anticipation of being denied entry into the U.S. One migrant admitted he had been convicted of attempted murder and hoped to get a pardon in the U.S. There has already been violence along the way as migrants fought with the Mexican border patrol, leaving at least one person dead. The Associated Press reported over the weekend that a child was abducted from the second caravan and it halted to assess the situation. With the midterm elections less than a week away, Trump continues to talk about the migrants as a threat to America’s borders. And on Wednesday, he said his administration is prepared to send 15,000 troops to Texas to reinforce the border patrol.